President Obama met with Israeli Prime Minister Netanyahu on November 9 in the White House and is considering the Israeli request to give a 50% increase of nearly $1.5 billion in U.S. military funding bringing the U.S. donation to the killing of Palestinians in the West Bank and Gaza to $4.5 billion a year. As it stands now, more that half of the U.S. foreign military spending for 2016 goes to Israel. As in all things, Israel gets special treatment by the U.S. allowing Israel to spend 25% of its gift from the U.S. to pay itself for buying weapons from its own weapons industry! According to a recent congressional report, Israel has received $124.3 billion in military assistance from the US since its founding in 1948. The report states that “strong congressional support for Israel has resulted in Israel receiving benefits not available to any other countries; for example, Israel can use U.S. military assistance both for research and development in the United States and for military purchases from Israeli manufacturers. In addition, U.S. assistance earmarked for Israel is generally delivered in the first 30 days of the fiscal year, while most other recipients normally receive aid in installments, and Israel (as is also the case with Egypt) is permitted to use cash flow financing for its U.S. arms purchases. As Obama was meeting Netanyahu, eight blocks away at the Palestine Center in Washington, DC, a surgeon from Norway who works on behalf of his university part of each year in al Shifa hospital in Gaza, told of the devastation, destruction and human suffering these American weapons and dollars cause. 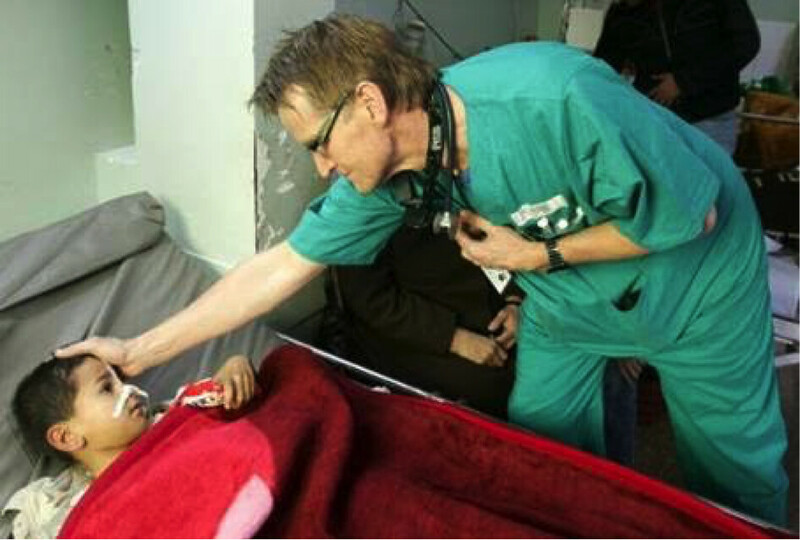 Dr. Mads Gilbert spoke of 51 days of terror in Gaza in the summer of 2014 as the Israeli Attack forces brutalized the people of Gaza with Israeli and U.S. artillery, assassin drone ordnance, F16s, hellfire missiles and dense inert military explosives. Gilbert said that the 2014 Israeli attack on Gaza was 500% stronger than 2009 attack. He was working at al Shifa hospital in 2009 when the IDF attacked Gaza. In 2014, the IDF fired 50,000 of those shells into Gaza and conducted over 6,000 airstrikes, destroying over 3,500 buildings in Gaza City alone including over 50% of the hospitals in Gaza. At the end of the 51-day attack, 2250 Palestinians were dead, including 551 children and 299 women. 3,500 Palestinian children were wounded and the 1 million children and youth who live in Gaza were all deeply affected by the attacks. 60 percent of the 1.8 million who live in Gaza are under the age of 22. Dr. Gilbert’s presentation included mind-searing photos of the carnage caused by Israeli attacks and the audio of the sounds of jets racing overhead, bombs exploding and buildings collapsing. Citing the report of the United Nations Independent Commission of Inquiry on the 2014 Gaza Conflict, Gilbert said the IDF purposefully targeted the civilian population including entire families, that the IDF purposefully targeted hospitals, ambulances and four UN shelter facilities. Additionally, “the commission is concerned about Israel’s extensive use of weapons with a wide kill and injury radius; though not illegal, their use in densely populated areas is highly likely to kill combatants and civilians indiscriminately. There appears also to be a pattern whereby the IDF issued warnings to people to leave a neighbourhood and then automatically considered anyone remaining to be a fighter. This practice makes attacks on civilians highly likely. During the Israeli ground incursion into Gaza that began in mid-July 2014, hundreds of people were killed and thousands of homes destroyed or damaged. The commission report stated: “Palestinian armed groups fired 4,881 rockets and 1,753 mortars towards Israel in July and August 2014, killing 6 civilians, including one child and injuring at least 1,600.” 66 Israeli soldiers were killed in military operations inside Gaza. This blind backing for whatever Israel does and providing the weapons to do it is dangerous for the United States and for Israel. As Israeli journalist Gideon Levy recently wrote concerning Hillary Clinton’s unwavering support for Israel, but can be expanded to the similar support given by both Republican and Democratic led U.S. administrations: “… support (for) the continued occupation is like a person who continues to buy drugs for an addicted relative. This is neither concern nor friendship; it is destruction… “false” friends of Israel – have been one of the curses on this country for years. Because of them, Israel can continue to act as wildly as it likes, thumbing its nose at the world and paying no price. Because of them, it can destroy itself unhindered. Israeli attacks on people in Gaza and the West Bank will end when we the citizens of the U.S. force our government to stop its military and diplomatic backing of the State of Israel. Ann Wright served 29 years in the U.S. Army/Army Reserves and retired as a Colonel. She also was a U.S. diplomat for 16 years and resigned in 2003 in opposition to the war on Iraq. She has been in Gaza six times and was on the 2010 Gaza Flotilla that was attacked by the IDF and who executed nine passengers and wounded 50.